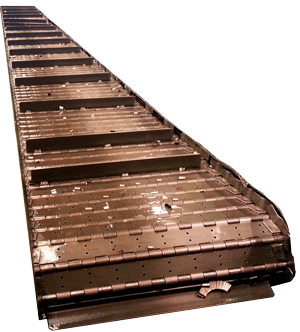 The HINGED STEEL BELT CONVEYORS consist of steel plates connected through a pivot and pulled by a chain. They are better suited for the transport of lightweight and compact material that does not enter the interstices between the pivots. All conveyors are equipped with safety devices in compliance with existing laws; in particular, the frames are closed on the sides with perforated sheet metal, the heads have safety guards and, if necessary, the upper and lower covers of the conveyors can also be similarly equipped. 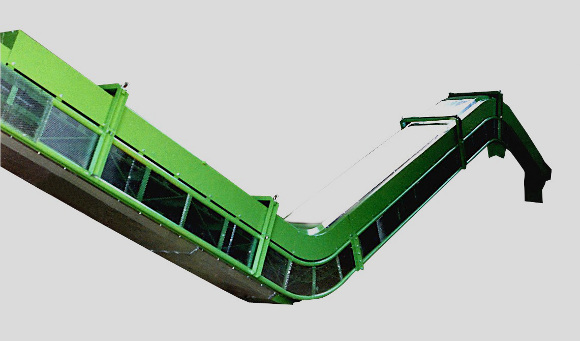 Various types of hinged belt conveyors can be manufactured with different dimensions depending on the morphology, specific weight and hourly flow rate of the swarf. They can be made of a single horizontal or inclined section or of a combination of these sections. These systems all have appropriate safety guards that comply with standards, so that no moving parts of the conveyor are in contact with the operator. system lubricant spray to reduce friction of the driving chains to facilitate their operation and conservation. 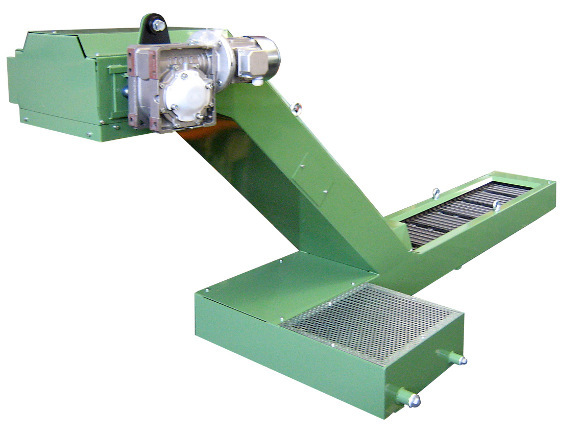 Various types of hinged slat conveyors can be manufactured with different dimensions depending on the morphology, specific weight and hourly flow rate of the swarf. They can be made of a single horizontal or inclined section or of a combination of these sections.